THE WRITING BUDDHA - Opinions | Books | Movies: Beyond What Meets The Eye by Sameera Kotta (Book Review: 3*/5) !!! Beyond What Meets The Eye by Sameera Kotta (Book Review: 3*/5) !!! As you guys are aware that I do not often fall for e-books considering the strain it causes to my eyes but still I keep trying some of them because for books, I can give away my eyes too. Haha! Well, sorry for the bad joke. 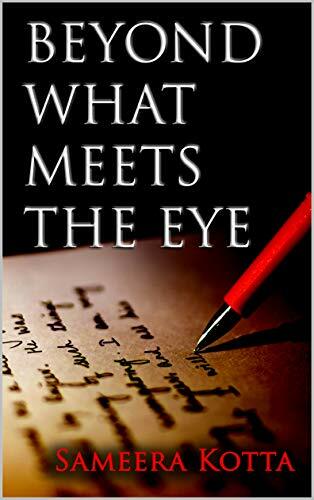 Today, the e-book which we are about to talk is Sameera Kotta’s “Beyond what meets the eye”. Considering that the authoress is a debutante, this 165-pages book is very well edited and kept up to the mark without dragging it to the boring level which many debutante end up doing in the passion of writing as much as possible in their first book itself. The two things which attracted me towards this book were the cover page and the title of the book. It is very necessary for the debutante to come up with a little different perspective when they write their first book and I am impressed that Sameera has been able to qualify in this aspect as her story is not the regular stuff which people are writing these days. Sameera’s writing style is simple which makes it easy for new readers who are just starting with books to complete the book within a sitting or two. Sameera has kept her book so well-edited as I have already mentioned above that it doesn’t make you want to skip any sentence or paragraph. Every word in the book takes the story ahead. The best part about Sameera’s writing is her characterization. Right from the protagonist, Majnu’s character to Varsha’s character including Soumya’s cameo, all of which is covered so nicely that you are able to connect with each one of them. The struggle of people living without parents, the students studying tough subjects like medicals etc, the pain they go through because of the tough past they have been subscribed to, the revenge that they want to take going out of their way etc. is very well handled through characters. Talking about the drawbacks of the story, I would say that author could have worked little more on developing the twists and turns in the book. Though the book is written in a manner where certain suspense’s are held up and revealed at some certain point trying to maintain the thrilling aspect of the story, but still, they are unable to make the reader jump off their seat or stagnancy of mind. If the book is supposed to be a thriller involving murders, death, goof-ups etc, it should be chilling and frightening. Overall, I would rate this book 3 star out of 5. Having good expectations from the authoress in the future.